A fMRI marker may predict the outcome of electroconvulsive therapy in severe and treatment-resistant depression. Electroconvulsive therapy (ECT) is effective even in treatment-resistant patients with major depression. Currently, there are no markers available that can assist in identifying those patients most likely to benefit from ECT. In the present study, we investigated whether resting-state network connectivity can predict treatment outcome for individual patients. We included forty-five patients with severe and treatment-resistant unipolar depression and collected functional magnetic resonance imaging scans before the course of ECT. We extracted resting-state networks and used multivariate pattern analysis to discover networks that predicted recovery from depression. Cross-validation revealed two resting-state networks with significant classification accuracy after correction for multiple comparisons. 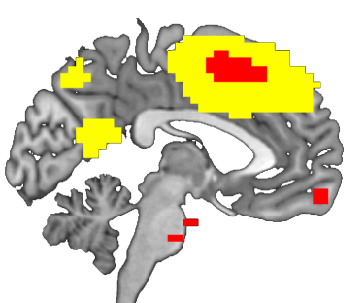 A network centered in the dorsomedial prefrontal cortex (including the dorsolateral prefrontal cortex, orbitofrontal cortex and posterior cingulate cortex) showed a sensitivity of 84% and specificity of 85%. Another network centered in the anterior cingulate cortex (including the dorsolateral prefrontal cortex, sensorimotor cortex, parahippocampal gyrus and midbrain) showed a sensitivity of 80% and a specificity of 75%. These preliminary results demonstrate that resting-state networks may predict treatment outcome for individual patients and suggest that resting-state networks have the potential to serve as prognostic neuroimaging biomarkers to guide personalized treatment decisions. J.A. van Waarde, H. S. Scholte, L. J. B. van Oudheusden, B. Verwey, D. Denys and G. A. van Wingen.(2015). A functional MRI marker may predict the outcome of electroconvulsive therapy in severe and treatment-resistant depression. Molecular Psychiatry 20, 609–614.